The Vatican had to react to millions of people gathering in Medjugorje, and the current Commission works seriously because the members believe Medjugorje is already deeply integrated within the Church, says Medjugorje’s pastor who calls it “irresponsible” to claim the seers lie. Fr. Petar Vlasic with Bishop Ratko Peric of Mostar in May this year in Medjugorje. Photo: Mile Pavlovic, Brotnjo Online. Rome had no choice but to take up a thorough investigation of the events in Medjugorje, and the result was the March 17th 2010 announcement of the current Commission led by Cardinal Camillo Ruini, says Medjugorje’s parish priest. “Neither the Pope, nor responsible Roman offices could overlook the phenomenon gathering millions of pilgrims in Medjugorje. Therefore, an advisable approach was carefully considered, and the Commission was established to thoroughly investigate” Fr. Petar Vlasic tells the Croatian daily Vecernji List. 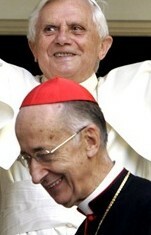 Pope Beenedict XVI appointed Cardinal Camillo Ruini (front) to head the Vatican Commission on Medjugorje. “They do their job seriously and are committed, because they believe that Medjugorje is deeply merged within the contemporary life of the Catholic Church” he further says of the Commission. “We cannot talk about satisfaction or dissatisfaction with their work. These are all serious religious people who care about truth and the good of the Church” says Fr. Petar Vlasic. “I think they played a vital role in everything from the very beginning. Since the beginning of their intrepid witnesses, they were not in any way embarrassed or intimidated by threats, or militia, or imprisonment, or harassment in school. They stood firm and upheld their original claims” Fr. Petar Vlasic says. Fr. 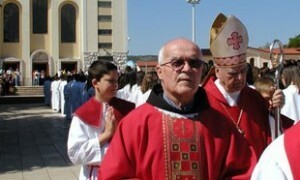 Petar Vlasic was appointed parish priest of Medjugorje in 2007. “We recognize the fruits of their claims on a daily basis, and they are serious people with their families and children. And it is irresponsible to call them liars, or to attribute to them all the diabolical influence as some still do, even among the clergy” Medjugorje’s parish priest tells Vecernji List.